Posted on Sunday, May 7th, 2017. - Filed under 60-Inch. 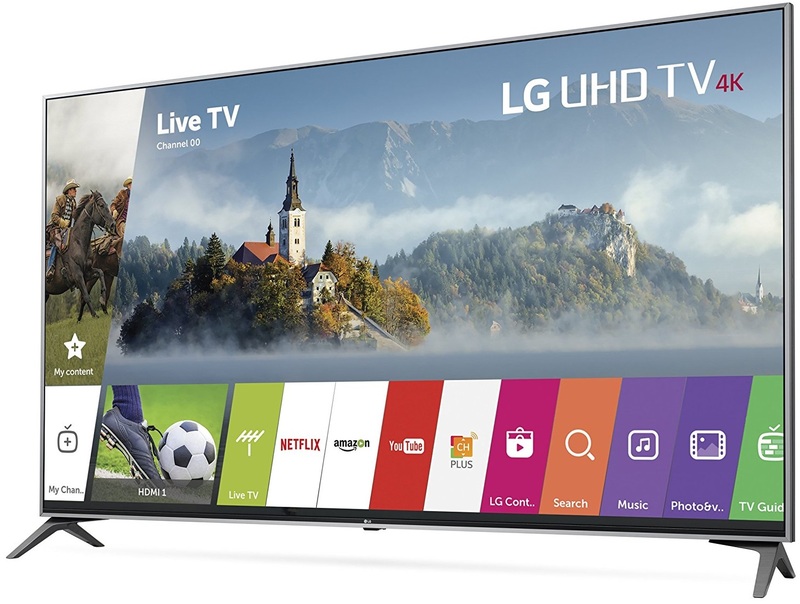 LG introduced LG 60UJ7700 and 60UJ6300 as the affordable choice for 60-Inch Smart 4K UHD TV. LG 60UJ7700 and 60UJ6300 are positioned as the standard 4K UHD TV from LG’s 2017 TV lineup. LG standard 4K UHD TV is the model that positioned below LG’s super UHD TV. From their model number, We can easily notice that LG 60UJ7700 is the higher model than LG 60UJ6300. What is better in LG 60UJ7700? I’m sure that you are interested to know the answer for that question if you consider LG 60UJ7700 and 60UJ6300 as your alternative choice for your next 60-Inch smart 4K UHD TV. LG introduced 60UJ7700 in the first quarter of 2017 as part of LG’s 2017 UJ7700 model. LG UJ7700 is the model that positioned directly below the LG’s Super UHD TV series. LG 60UJ7700 comes with 4K UHD Resolution that combined with 4K upscaler so that It can deliver lifelike details from both original 4K content sources or HD contents that upscaled into near 4K picture quality. IPS 4K panel is used in LG 60UJ7700 to bring accurate details from any angle you are watching. LG 60UJ7700 comes with Wider Color Gamut with True Color Accuracy to bring wide color spectrum of color on the TV screen. You can also find Local Dimming with Ultra Luminance that bring more vibrant contrast on the TV screen. LG 60UJ7700 is completed with Active HDR that support Dolby Vision, HDR10 and HLG. The Smart TV Platform of LG 60UJ7700 is WebOS 3.5 that comes as the improvement of WebOS 3.0. WebOS 3.5 can bring your favorite contents to your home. You can enjoy your favorite movies, sports, TV shows and music anytime you want to enjoy it. It’s also easy to control the TV and WebOS with magic remote control that utilized with natural voice recognition feature. LG 60UJ6300 comes as the most affordable option for 60-Inch Smart 4K UHD TV from LG’s 2017 TV lineup. 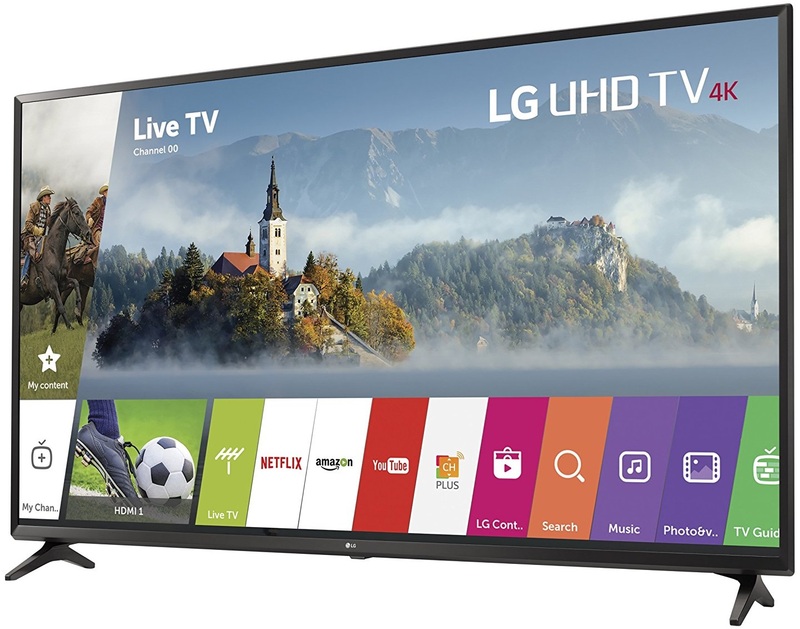 LG 60UJ6300 comes with 4K UHD resolution that completed with 4K Upscaler so It can deliver brilliant picture quality from both original 4K content sources or HD contents that upscaled into near 4K picture quality. LG 60UJ6300 is also completed with IPS 4K panel that help you to enjoy wide viewing angle. LG 60UJ6300 comes with True color accuracy for accurate color details. TruMotion 120 is the refresh rate of LG 60UJ6300. With TruMotion 120, We can enjoy smooth fast motion images on the 60-Inch LED screen of LG 60UJ6300. LG 60UJ6300 comes with Active HDR as its HDR technology, but its support is limited. It only supports HDR10. The Smart TV platform of LG 60UJ6300 is WebOS 3.5. WebOS 3.5 can deliver premium entertainment to your home with the help of 802.11ac wireless that can bring faster internet connection so you don’t have to experience streaming delay. The key specs & features of LG 60UJ7700 and 60UJ6300 can be found on the table below in similarities and differences format. We need to know the specs & features of those two TVs before We can talk more about their differences and what is better in LG 60UJ7700. So let’s take a look at the table below to know more about their similar and differences specs & features. What is Better in LG 60UJ7700? The table above tells us that there are differences between LG 60UJ7700 and 60UJ6500. What’s better in LG 60UJ7700? LG 60UJ7700 comes with better picture technology and magic remote. You can find Local dimming and Ultra Luminance technology installed in LG 60UJ7700. With Ultra Luminance and Local dimming, you can experience better vibrancy level in LG 60UJ7700 screen. While Active HDR is installed on both of LG 60UJ7700 and 60UJ6300, but the HDR format that supported by those two TVs are different. The Active HDR of LG 60UJ7700 support Dolby Vision, HDR10 and HLG, while the Active HDR of LG 60UJ6300 only support HDR10. LG 60UJ7700 is already completed with magic remote, while LG 60UJ6300 is not included with magic remote. With better picture technology and included magic remote, We can easily conclude that LG 60UJ7700 is the higher model. As the higher model, We can find LG 60UJ7700 is usually offered at the higher price than LG 60UJ6300. Why Should You Consider LG 60UJ7700? Related Post To LG 60UJ7700 vs 60UJ6300 : What is Better in LG 60UJ7700? You may be interested in UN60KU6300 and UN60JS7000 models from Samsung as your next 60-Inch 4K UHD TV. They come from different lineup year, but now They are priced at almost similar price. Samsung UN60KU6300 is the basic..
Samsung UN60JU6500 vs LG 60UF7700 : Which of Them is the Better 60-Inch Basic Smart 4K UHD TV? Talking about 60-Inch Smart 4K UHD TV, especially for the basic model, then Samsung UN60JU6500 and LG 60UF7700 are two models that We can’t ignore. Along with Samsung UN60JU6400, UN60JU6500 is positioned as the basic model for 60-Inch..
Are any of these TVs available for purchase?